The captioned words above of Mark Twain had long ago set me thinking as to whether I should take the road less travelled and become a voice for the thousands out there who are struggling with the stresses of life. I brushed away this thought, only to see it resurrected again during my journey as a caregiver to my wife, Doris Lau Siew Lang who has to struggle with schizophrenia and depression, amongst other health ailments. My intention in raising the plight of the mentally ill and their caregivers over the last six years in the media was to seek understanding and support from the Government and society as a whole. I have also made some suggestions to improve our mental health care and I am encouraged that some progress has been made. However, we still have a long way to go before as far as mental health is concerned. Many people in society, even educated ones, are still indifferent to the mentally ill. A large number of people choose to remain indifferent because of fear. Their fear and lack of understanding of mental illness often leave the afflicted shunned and discriminated against. This fear, when left unchecked, will continue to obstruct moves towards a more compassionate society, in which we care more humanely for the mentally ill within our community. Some data on mental illness. Worldwide, an estimated 800,000 sufferers of mental illness kill themselves every year. Another startling revelation: worldwide, mental illness strikes one in four people, and two-thirds go without treatment. In Singapore, more people die from suicide than in road accidents. Of the more than 1,700 suicides between 2000 and 2004 (an average of 340 a year), up to seven in ten victims had some form of mental illness. Earlier studies indicate that one in six people suffer from some form of mental illness. What is schizophrenia? Schizophrenia is one of the most distressing mental disorders. The illness first struck Doris at the tender age of 17. Today, my wife has to cope with several other chronic illnesses – severe arthritis that leaves her mobility impaired, diabetes, high cholesterol, incontinence and stomach problems. Managing Doris’ medication and taking her to see several doctors can be very stressful. She takes 43 tablets a day- 21 of these tablets relate to the control and treatment of the schizophrenia. During our 37 years union, my wife has suffered 11 relapses of her schizophrenia, and the price is just too high- financial, physical and emotional. Schizophrenia alters the way people think and feel, so that perceptions may be changed and thinking can be disturbed. This is very disabling for them and very distressing for their families, who often become the primary caregivers. One of the cruellest aspects of the disease is that the sufferers so easily alienate those closest to them before anyone knows that they are ill. It effectively robs them of the love and support that are vital in dealing with the devastation wrought by mental illness. Additional Pain and misery brought upon by physical ailments. Even though Doris is currently coping well with her mental illness and many others can also be helped to control the condition with the right support, a relapse of her schizophrenia is always possible. It’s like walking in a mine field – you never know when the bomb will explode! This is because of her struggles with arthritis, which often leave her in severe pain and misery. People with mental illness can relapse if a severe physical illness is not properly managed. Doris worries a great deal that one day she might not be able to walk. I have to constantly assure her that despite all her ailments, I will continue to care and love her to my last dying breath. Caregiver strain and burnout. The strain of looking after my wife for more than three decades is badly affecting my own long term health I am experiencing nerve and eye problems. I worry a great deal. If my health suffers, who is going to look after my beloved wife, and I certainly do not want her to end up in a nursing home? This is why it is imperative for Government-led support for the mentally ill and their caregivers. I have suffered burnout countless times. The reality: When you are looking after a family member with mental illness, you are all alone in this world. Sitting in support groups has also made me realise that there are many caregivers who are suffering in silence. Some caregivers are looking after more than one person suffering from mental illness. This is the main reason why I have been pleading for support for caregivers. Many a time, the focus is on helping psychiatric patients and the caregivers are completely forgotten. When caregivers of the mentally ill do not get the vital structural support which they so badly need, they too can develop mental illness. It happened to me. In 1995, stressed out by family life and work, I attempted suicide. I was fortunate to have been saved. But just imagine what would have happened to Doris if I had lost my life. Stress on marriages. Often marriages are put to the test when couples are confronted with financial problems or if a spouse is stricken with chronic illnesses. Divorce cases are going up In Singapore and are expected to rise as the stresses of life find people simply giving up. Many couples don’t have the resources physically, emotionally or financially give their troubled marriages as fighting chance. I have seen the rewards of sticking by my wife through thick and thin. Strange as it may seem, I have grown to love Doris more and more as I see her suffer and struggle with so many illnesses. Embracing hope. Despite facing adversities, I continuously look out for new directions and opportunities in my life and that of my beloved Doris so that I will have the financial means to support my wife, and for her to break free from schizophrenia and depression which has ravaged more than half of her life. I hope that our love story will inspire, motivate and encourage caregivers not to give up in caring for their own stricken family members. I am a regular contributor to the forum page in the newspapers and I have been putting forward informed proposals for improving the mental health care system in Singapore. To-date, I have written 102 letters to the press on mental illness and other social issues. In addition to the obstacles and hardships I have personally experienced in caring for my wife I have also personally come across cases where families live in dire straits and read of others in the media. The culmination was that I felt a calling to speak out on issues that may improve their well-being. All these efforts, I hope, will translate into giving our marginalised communities the support, which they are in dire and urgent need of. I hope in the future others will not feel as helpless as I do when I see Doris in pain – both physically and mentally. Certainly, our journey will definitely be made much easier if Singapore has a good caregiver structural support system in place. If we aim to be the leading mental health care system in Asia by 2012, then we must also have this good caregiver support system in place. This is an area which I hope the Government will give more attention to. 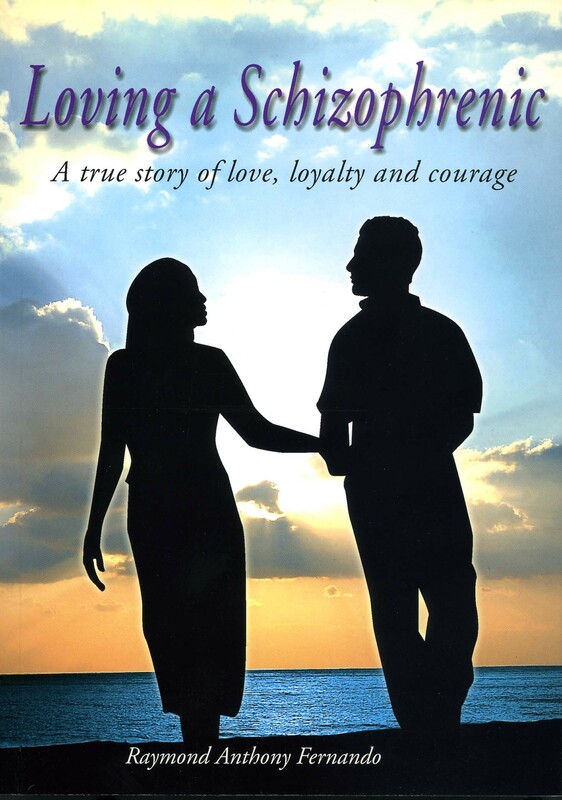 In 2004, I managed to bounce back, and decided to write about my wife’s struggle with schizophrenia in a novel entitled, “Loving a schizophrenic”. This is a true story written by me about my wife who suffers from depression and Schizophrenia. (The names have been changed to protect the characters in the story from prejudice and discrimination). A heart-warming story of the healing power of love, this book chronicles the trials and tribulations of our courtship and 30-year marriage. It also provides an insightful peek into caring for a loved one stricken with mental illness. This is the first time that a caregiver in Singapore has written such a book and it is intended to raise awareness of mental illness. This book eventually went on to become a best-seller and moved hundreds of readers, including those from overseas. Later, I went onto author ten other books. Then another “window” was opened. With much emotional support and love Doris, has been helped by me to become an author herself of not one, but five successful books. This is truly a remarkable achievement for someone suffering from a serious mental disorder. Readers who wish to purchase this book and help me find the means to support my wife and I, can do so via my blog spot, see below, or at the Reform Party Open House and other events. The book costs $15. This novel was the turning point for me. From here, I went on to chart new directions in life. I have counselled troubled youths and adults on FACEBOOK and even invited caregivers and patients into our home to encourage them to go for treatment by using my own wife’s coping skills to motivate them. To give people who face challenges in life, hope, I give motivational talks all over Singapore encouraging my audience to walk the journey if and when they are confronted with difficulties. I would like to reach out to the heartlands where many cases of suicide and persons suffering from mental illnesses are troubling. As a further means to encourage people to stay resilient and happy despite facing adversities, I have shared our life story on national television 6 times, 3 times on radio and in many occasions in the press. We must understand that those with mental illness and their caregivers face great challenges: stigma, financial and social support, employability, housing difficulties, crisis intervention and high rate of relapses. This is why I have been pleading, through the media, for the Government to raise funds for the mentally ill and their caregivers on a national level. If we can raise funds on a national level for physical illnesses such as cancer, heart diseases, kidney ailments etc, then why can’t we do so for mental illness, given that it is never easy for persons with mental illness to secure jobs. Caregivers too may have to give up their full-time jobs to look after their stricken ones. This means a loss of income. I strongly feel that the clause requiring job seekers to declare that if he/she has/had any mental illness on the job application form is outdated and places those who are seeking treatment for depression and other forms of mental illness, at a clear disadvantage. If we want to give every citizen equal opportunity, then such a clause, inherited from the colonial days, should be removed. Until today, I cannot secure some tasty cooked meals for myself and my wife. When I was warded in Tan Tock Seng Hospital (TTSH) a few years ago for a prostrate operation, I was given some delicious nutritious meals at the C class wards. So, nursing homes can learn the skills of the cooks at TTSH. There are also far too many regulations, restrictions and obstacles that make home delivery for cooked meals impossible to secure. If I can get proper cooked meals delivered to us for just 3 times in a week, it will help me to find some respite, given that my wife can no longer do cook and do housework because her arthritis condition puts her at fall risks. My wife who is unable to take the MRT or bus depends on travelling by taxis because as I mentioned earlier, she is at fall risks. On the average, her medical appointments, blood tests, X-rays etc., can be as much as 4 times in a single month. Quite a number of her medical appointments fall within the peak hour period- leaving me to incur additional taxi fee payments when the taxi surcharges and ERP charges set in. Given that I do not have a full-time job, I hope that people with disabilities can be exempted from these additional taxi charges. I have made appeals, but my repeated cries for help have been unsuccessful. As Singapore journeys towards becoming an inclusive society and caring nation, it must bear in mind that there will always be people who may need more help. And undoubtedly, the mentally challenged, the lonely elderly and their families are some of those who need a great deal of help. See above for details on ordering Raymond’s books. I’m a caregiver to my 83yr old Mum who is an end-stage renal patient for the past 13+ years and a long time sufferer of arthritis pain. The onset of dementia in 2011 and a major brainstem stroke in Aug 2013 further took a merciless and brutal blow on her already frail and weak body. Much of what you have blogged resonated to me in my experience as a full time caregiver to my Mum. Looking after my beloved Mum is a privilege, never a job to me. You mentioned that you once experienced nerve and eye problem as a caregiver to your beloved wife. Could you share with me what were the symptoms?